Reagan slept the whole night through last night. 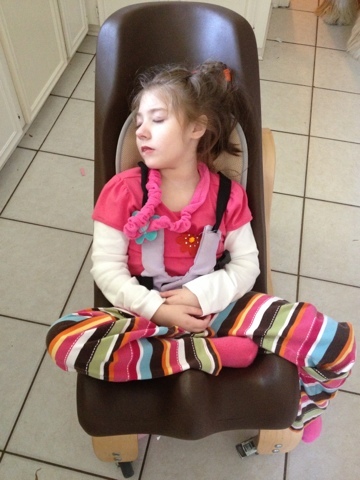 She was in her chair, but at least she slept. She woke up this morning, super serious and not at all happy, but she wasn't crying either. That kinda sums up her day. She's had the same scowl on her face all day today. She didn't want to be bothered at all. Her temperature regulation is still off (clammy hands/feet and sweaty back) but I'm hoping that she's on her way to better days. We switched her formula back to the 20kcal/oz last night (+Duocal), so hopefully that will agree with her tummy. I really do hope we can figure out something to help her get the food she needs without overwhelming her GI system (like we've been doing for the last 3yrs). 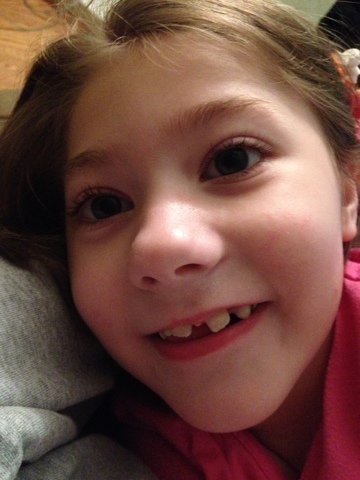 Grandma is coming Sunday, so hopefully we'll have our sweet, smiley girl back by then! Thank you for your continued prayers! Reagan spent most of the night awake and crying! Our night nurse was here (and holding Reagan most of the night), but I still got up several times to check on her. Then this morning she seemed like she might be turning a corner. She laughed for Daddy and then she was pretty quiet. I called GI and made an appt just in case. She had OT and speech and all went well. And then, the crying returned with a vengeance! We took her in for her appt and the doctor listened to her stomach...which sounded fine. Then he ordered an abdominal x-ray. She slept through it all and then we went back up and spoke with the doctor again. He reviewed her x-ray and was a little concerned with how her j-tube looked (it resembled a candy cane down the right side of her belly...apparently it should zig zag across her abdomen instead of going straight down one side). He thought maybe she had malrotation of her intestines, but then looked back at an old upper GI study she had done when she was a baby saying her anatomy was normal, so he said that couldn't be the issue. He did say (and I could clearly see) that she had a lot of air throughout her intestines (and this could be what is causing her pain). There is not much we can do about that. And from what I have seen, it seems to be a fairly common finding in kids with mito. So our issue is what do we do about her formula. Obviously she was doing MUCH better on the 20kcal/oz formula (and when we increased the calories, we saw worse and more frequent bad days)...but she was steadily losing weight on it! So now we are going to try giving her the regularly made formula at 20kcal/oz but adding Duocal to it to try to increase the calories. We're starting slow...just bringing it up to 24.5kcal/oz...so we'll see. We need to get her to an amount where she won't lose anymore weight (she's back up to 41 lbs). Not sure why the Duocal calories would work better than the formula calories, but it's worth a shot. Please keep it in your prayers that we can find something to work for our sweet girl! She was really miserable again tonight. Praying that she can get some sleep and wake up feeling better in the morning! Reagan did not sleep much last night. Thankfully we had our night nurse and she held Reagan (and she slept off and on in her arms). No more nausea after switching over to pedialyte, so that's good. Of course, now we have to add back formula so we'll see how that goes. She's had THREE dirty diapers today (all before 12:30pm)...I'm guessing that could make anyone's tummy a little uneasy. She definitely seemed the most calm after the third one! She ended up having a good day today. She was still slightly on edge (she did NOT like the lawn guy mowing outside), but she had multiple therapies/school and she did well with them all! Tonight she was pretty spitty, but no real nausea (at half formula/half pedialyte). I could tell she was getting a little more tense as the night went on and about an hour after her night nurse got here, she started up with the crying! Poor thing. Her tummy was rumbling, so I wonder if maybe she has more business to take care of. 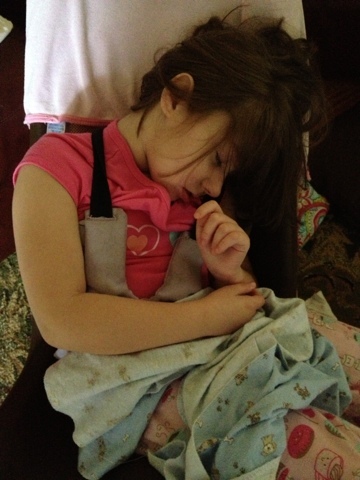 I gave her a dose of clonidine and Daddy rocked her on the swing until she fell asleep. Hopefully she continues to sleep. I'm a little worried about what tomorrow is going to bring (we've been teetering on the edge for days), but if it's a bad day, we're going to be making a trip in to see the GI like we discussed last week (not looking forward to having to take her anywhere on a bad day). Please continue to keep my girl in your prayers! Reagan did not sleep well last night. She was very restless and at times sounded a little agitated. Daddy tried to get her back to sleep but she was really resisting it. I gave her Lortab and she eventually went back to sleep, but it didn't last long. I was definitely worried and didn't know what to expect this morning, but she woke up a sweetie! She was still a little easily excited, but overall good. She had OT this morning and did well with that. We had to cancel speech because she had her appt to get her GJ tube changed out. We got there right around 1 (the time of our appt) and then we waited and waited and waited! Finally at 2:40pm, they took us back. SO frustrating! It only takes them minutes to switch hers out, but they were running behind (an hour and a half is more than behind)! Reagan handled the wait much better than her brother! He got quite fussy in the waiting room! Everything went smoothly, but tonight she's experiencing some serious nausea! I don't know if it's because of the tube change, or maybe she's just fighting off bad days, I don't know. She was sitting up in her chair and out of nowhere she had a big throw up. I picked her up and held her for a while and then she had a big dirty diaper! After the night nurse got here, I decided to hook her g-tube up to a drain just to check her tummy. Tons of clear fluid came pouring out (no wonder she's nauseous)! Thankfully, no formula (so it shouldn't be related to the placement of her tube). Later on, she had another big throw up solidifying my decision to switch her over to pedialyte tonight. Poor girl. I don't think she's thown up since the cupcake she ate on her birthday!! I'm still not sure what to expect tomorrow. She's still very tense and a little jumpy, so I'm hoping she can settle down and get some sleep tonight. Please continue to keep her in your prayers! Reagan slept OK last night. She did wake up around 5am fussing a bit and was resistant to go back to sleep. I gave her a dose of Lortab and in less than a minute, she was OUT. Doesn't usually work that quickly. It didn't last long though...she was back awake by 7:15am. Thankfully, she woke up a little happier. She's been in a good mood all day today. Very wide eyed and alert. Still easily excitable (especially by her loud brother) and vocal (increasing in frequency and agitation tonight). Her hands have been especially cold and she's had the hiccups quite a few times, but otherwise things have been normal (except for the unusually large number of wet diapers she's had today....10). I have no clue what to expect tomorrow. I think she could go either way. She has her gj-tube change scheduled for 1pm tomorrow, if she wakes up happy we'll go...if not, we'll reschedule. Please keep her in your prayers. I'd hate to see her have bad days again already. Reagan slept well last night. She woke up this morning smiling, but still a bit kooky. She's been VERY vocal today. At times it sounds like a happy vocal and at times it sounds like she's about to freak out! Lots of "talking" and some screams/squeals (although she could have just been copying her crazy brother)! A bit more tense...lots of crunching, hands up in her hair nonstop. She and her brother are still battling the runny noses. Not sure what tomorrow holds for her, but it's way too soon for another bad day! Please keep it in your prayers that she can continue to have good days! Reagan had a sleepy day today. She woke up this morning but only was awake for a short while before dozing back off again. She slept in her chair for a few hours and then we realized she wasn't going to wake back up, so we moved her into her bed. She'd move around here and there, but she never opened her eyes. Then finally around 6:30pm she started moving around and she opened those big beautiful eyes! She was sweet, but a little kooky. She almost got a little too excited when we were facetiming Grandma! She's still got a bit of a runny nose. Tonight (and last night) I noticed a little redness in her face, right around her neck and chin. It looks almost like a rash or allergic reaction, but she hasn't had anything unusual, and I keep noticing it at the same time each night. Not sure what that's about. I also decided to just hold steady at 27.5kcal/oz on her formula. I was supposed to increase it again last night, but I think we'll go another week or two at this concentration. We weighed her last night and she's gone from 38lbs to 41lbs since the increase, so I don't think we need to rush it. Ryan has been a piece of work today! Very fussy. Lots of crying. I'm not sure if it's just his teeth bothering him or if it's a cold. He's still got runny nose (but that could be from the teething), but he's also been coughing a little today. Poor boy. He does not handle sickness well! Reagan slept well last night. She woke around 7am...no smiles, but content. That pretty much sums up her whole day. She's given us a few laughs, but in general, she's been serious, wide eyed, and content. She had OT this morning and she ate a little and seemed to enjoy it. She's been a lot less congested today, but her nose is still a little runny/crusty. Speaking of runny, my nose has been horrible today. Lots of sneezing...not a good day for my allergies. Ryan is still a bit snotty too, so maybe we've all got some sort of head cold or something. 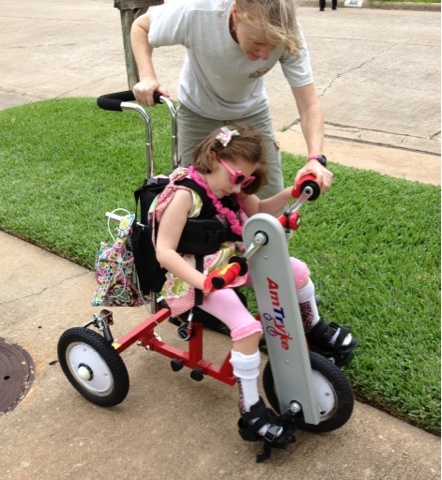 This afternoon Reagan had PT and she did well for that and then stood in her stander for an hour afterward. She's been a little jumpy tonight (easily startled). She was very snuggly, but any little noise caused her to jump. I'm hoping she can settle down and get a good night's sleep again tonight. We've got a new nurse working tomorrow, so I'm praying everything goes smoothly and that it's a good fit. Reagan finally settled down and dozed off last night with the help of Clonidine. It didn't last long though, she woke at 2am and was fussing, so a dose of Lortab helped settle her back down and get her back to sleep. It was a restless sleep though and she wouldn't tolerate being laid down, so the night nurse just held her the rest of the night. When she woke this morning, she woke with the giggles! When I heard her, I knew she had turned a corner. She's feeling MUCH better today. She's still not 100%...her body continues to be very tense, she's very congested, and she's still got super cold clammy hands and feet...but she had two dirty diapers today and I think that has helped, so hopefully she'll be feeling even better tomorrow! I spoke with her GI doctor today and he wants us to bring her in on her next bad day, so that he can examine her and do an abdominal x-ray to see if she's "backed up" or has excess gas in her colon during these episodes. I definitely think it's related to the formula (and GI pain). I didn't notice much of a difference at 22.5kcal/oz, but once we moved up to 25kcal/oz, she's been a little more gaggy/burpy. And then now at 27.5kcal/oz, she's had the worst bad days we've seen in a very long time. I'm going to continue with the increase and Friday night switch her over to the full 30kcal/oz, but if we continue to see worsening, we'll be making some changes in the very near future. Please keep it in your prayers that we can figure out how to get her enough calories without overwhelming her GI system...there's got to be a way!! It's been another miserable day for my girl. She thankfully slept well last night, but she woke this morning feeling pretty rotten. Very tense, lots of crunching and grabbing at her hair (and scratching her face), lots of tears...poor girl. She had periods where it seemed she might be getting a little better, only to get upset and start crying all over again. Poor thing, she didn't even get to enjoy her grandma while she was here!! I sure hope she's feeling better by tomorrow... These last couple days have been brutal! Please keep her in your prayers ! Today was a complete and total bust! I'm so upset about it. Weeks in the planning...shopping for the perfect coordinating outfits for everyone, getting haircuts, making sure Grandma was going to be here...and we had to cancel our photoshoot. I got a little nervous when Reagan slept in this morning. She was restless around 8am, but I went in and changed her diaper and she fell back to sleep. And she continued to sleep until after noon. When she woke, she was NOT happy. It's been a miserable day for my girl. Lots of crying, holding her breath, she's obviously in pain. I knew right away that we were going to have to cancel our photoshoot. The biggest problem...the photographer had already said there would be no rescheduling these sessions. I admit, deep down, I really thought she would reconsider if by some strange chance we had to reschedule. I mean, she knows our situation, she knows Reagan. But no, she will not. So...all of that preparation was for not! I was SO looking forward to new beautiful pictures of my girl. I guess I'll just try to find a new photographer in Austin...but I won't lie, I'm pretty bummed about it. Hoping my sweet girl can get some sleep tonight and some relief for what is bothering her (and praying it's not related to the increase in formula concentration). Not sure how well my girl slept last night. She was pretty restless...and so was her brother. 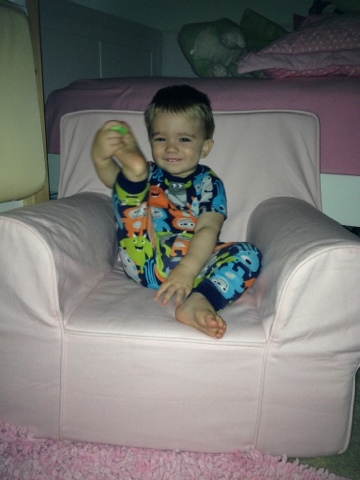 Unfortunately, brother woke up this morning on the cranky side, running a fever and with a nose running nonstop! Poor thing. You've never seen something so pathetic! I've given him pain reliever off and on all day today. Meanwhile, Reagan has been good, but there are some things that are definitely a bit off with her. Her body has been tense and temperature control has been way off (sweaty back, cold clammy hands and feet). I'm nervous about our photoshoot scheduled late tomorrow afternoon. The photographer specifically said this was the only day available to do it and there would be no rescheduling! Please keep it in your prayers that both kiddos are able to get some sleep tonight and wake up feeling happy and healthy (or healthier) tomorrow!! 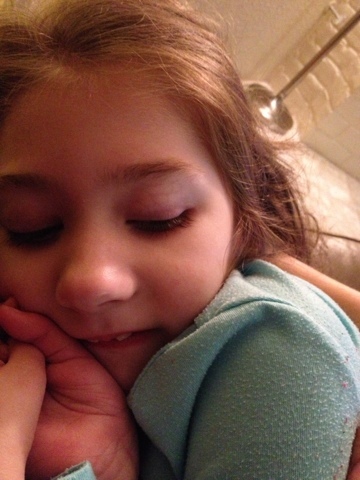 Reagan slept well last night and woke up sweet and smiley again this morning. She woke up with a bit of a crusty nose and a little congested, but otherwise good. 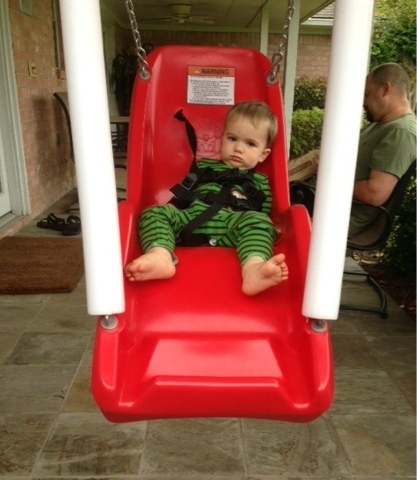 She had PT early and she worked on sitting balance, on the swing, and she was doing really well with her head control. 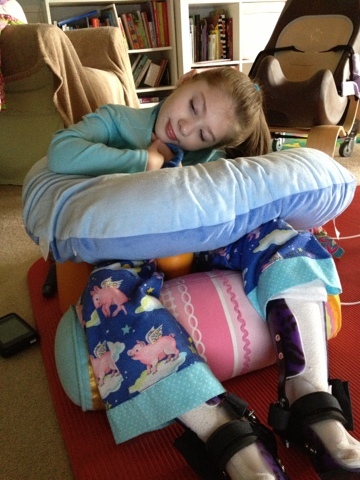 At the end her therapist put her AFOs on and put her in the stander. Everything was going smoothly, she was happily looking at her iPad, when I noticed a problem. Her AFOs were on the wrong feet! In her therapist's defense, these current AFOs aren't the greatest fit, so it's not really easy to distinguish the left from the right! We immediately took her out and took the AFOs off and her feet were really red (I guess her feet can tell the difference better than we can)! She needed to come out of the stander anyway...that little bit of gravity helped her to finally have a dirty diaper (yeah)! She got a little sleepy for a bit, but she never really dozed off. The rest of the day we just took it easy. It was another good day for my girl. Hoping and praying for a couple more! Her hands and feet were cold and clammy today and she had a bit of the bad day smell, but she's been wonderful so I'm keeping my fingers crossed. Tonight she's definitely restless (so is her brother). She fell asleep on my lap and was very jumpy. After laying her down, I've been watching the monitor and one minute she'll be moving with eyes wide open, and the next, she's completely still and asleep! Of course she'll be restless tonight...no night nurse! I just left her room...she was tossing and turning...she had leaked through her diaper and her pants and bed were wet! She's dry now, so maybe she'll settle down and sleep better. Please continue to keep her in your prayers (I'm going up on the calories in her formula tonight...we're up to 27.5kcal/oz)...come on good days!!! Reagan slept all night last night and woke up a sweet girl again this morning. She had vision therapy this morning and the therapist brought her 4yr old and Reagan really seemed to enjoy interacting with her. She had a great session...boy are we going to miss our vision therapist! On the moving front...we're still looking at moving sometime this summer (probably July)...but it looks like we're going to be moving to Austin (instead of Dallas). My Dad/Stepmother and stepsister & fam all live in Austin and we've always wanted to move there, but I'd be lying if I didn't say that I'm sad to not be moving closer to my mom. Well, we will be closer, 4hrs instead of 5, but 30min would have been so much better! Anyhoo, so that's about all we know right now. No definite dates or plans just yet. Have packed a couple boxes, but I have an entire house to do so that's a little overwhelming! Back to the day at hand...Reagan had a good one, but a little on the sleepy side again. She dozed off around 11:45am and then slept til 4pm (she missed school). Her speech therapist needed to come late today, so that worked out perfectly. No real eating today, just licking on a butterscotch lollipop...she's been a little chokey, coughy the last couple days. I'm wondering if she has some sort of allergies/sinus drainage going on...even her brother has been a little sneezy today...so maybe? She sure has been a sweet girl though. Hoping (and praying) she continues to have good days. Early morning opthalmology appt in the medical center tomorrow morning...should be fun. Reagan slept well last night (much better than previous nights) and woke up this morning right around 8:30am. She was sweet and smiley...so that's always a good sign! She had OT at 10am and she was doing well with that, that is, until she fell asleep! She continued sleeping until 12:10, when we had to get her changed and into the car for her hair appt. She woke up smiling as soon as we started messing with her. She did well for her hair cut. She was a bit squirmy, but OK (not a huge fan of the blow dryer though). Her hair turned out cute! 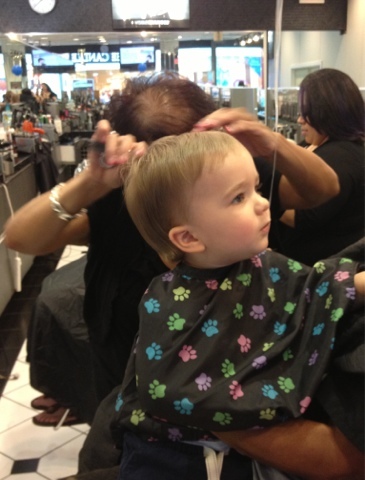 It's a little longer than previous cuts but that was on recommendation of the hair stylist. Reagan's hair is starting to get a bit of a wave in it (like her mommy...poor her), and if she cut it too short, it would really wave and be unruly. I think it looks cute. It remains to be seen how well it's going to behave! (But we could say the same thing about Reagan and Ryan!) Ryan got a little touch up to his hair and he looks cute as well! Reagan fell back to sleep shortly after we got home. Who knows, maybe this was her sleepy day! While sleeping, I took advantage and painted her little toes again! We've got a photoshoot this weekend, so she had to have her toes touched up! She woke up around 8:30pm and was awake until 10:30 or so when she dozed back off smiling! She sure has been a sweety today! Save some of this sweetness for the photoshoot Sunday Reagan!!! Reagan was a good girl today. She didn't sleep super well last night...she was very restless and I got up to cover her back up a couple times (and she was wide awake)...but she was sweet and smiling. She's had a good day today. Still a little tense in her body, but her overall demeanor seems much better. Lots of smiles, lots of laughs (sometimes crazy laughs). The only thing she had today was school this afternoon. She was very attentive and did a great job! Not much more to report. She has her rescheduled hair appt tomorrow...time to cut that hair off again! I'll leave you with this, a gift from the best mom and grandma anyone could ask for (Happy late Mother's Day mom)!!! 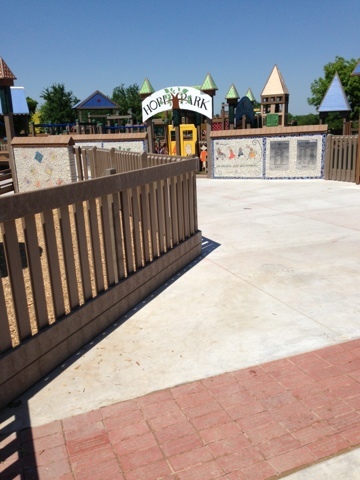 Hope Park is a special needs inclusive park that they just built in Frisco TX. 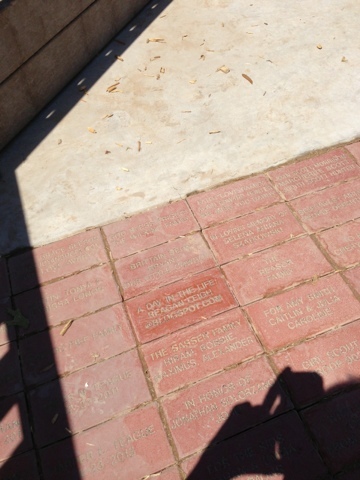 Grandma bought a brick for her Reagan! Reagan slept well last night and then woke up this morning serious. The crazy laughs came later and were abundant tonight. She had a pretty good day today. More happy, less tense...that is, until tonight. This afternoon she had two dirty diapers, so I'm pretty sure that had something to do with it. I think tummy pains are at the root of a lot of her problems. Tonight she was laughing and she sounded happy. Then her laughs had a touch of whine to them. Next thing we know, she's this close to tears! I gave her some Lortab and that seemed to take the edge off a little but then she started getting agitated again. She finally dozed off in my lap. Poor girl! She can't catch a break. So many good days and now so many off days! I think Reagan slept well last night. She was awake and kicking around when I woke up this morning...so I hope she slept! She woke up in a fairly good mood. She had the crazy laughs all morning. She was definitely on edge...kicking around like crazy, chewing on her hands, and her temperature regulation was way off...but she held it together. This afternoon we went to a birthday party for her cousin and there were some tense moments, but she was OK. Ryan seemed to enjoy all the kids running around...Reagan could have done without all the noise. Tonight she continued with the laughs. It seemed like she was never going to get sleepy...she was still going strong at 11:30pm! Finally she started looking groggy with the help of clonidine. Hopefully she can get some sleep...I know her body must be exhausted. It's been one of those days. It all started out well enough. Reagan slept the whole night last night. She woke this morning serious but OK. Then she started with the crazy laughs. Her body was super tense. Couldn't hold still for a second, gnawing on her fingers nonstop. She made it through the morning without any incidents, then this afternoon I ran to the store with Ryan and I get a call from the nurse. Reagan is SCREAMING in the background. I panic...is she injured, did the nurse drop her, did she bite herself, did her tube get yanked out???? The nurse can't even hear me asking her questions because of all the screams. Finally she tells me that she just went from laughing to crying! I told her to give her Lortab and then headed home. Before I could even get home, the nurse texted me telling me she had stopped (before she even gave her the medicine). She was still VERY tense, very stressed, but at least she wasn't crying. She stayed this way until about 15min after the nurse left. She started with some whimpers and then went into full blown screaming crying (holding her breath til she turned purple)!! The tears were flowing (from both of us). It's just so heart wrenching. I gave her Clonidine and then Lortab, but nothing was helping. I felt completely and totally helpless. And it's times like these that my mind starts to wander...to places I don't need to go. The "why Reagan"? Why does she have to go through this? It's not enough that she's severely disabled and can't walk, talk, eat...it's not enough that she suffers from an incurable disease...she has to suffer. I hear people (with disabled/medically fragile children) say all the time that if given the chance, they wouldn't change anything about their child. Not me. I admit that I am a far better person for having lived this life. 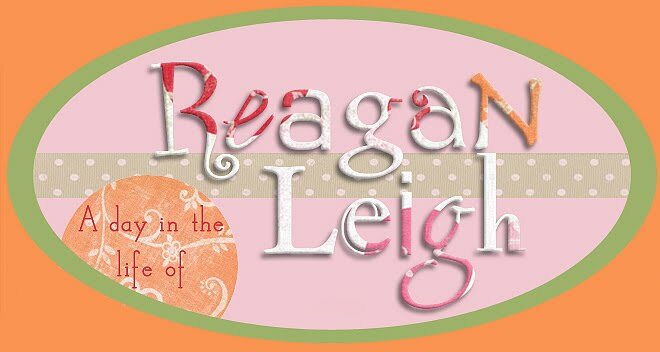 I'm closer to God, I love Reagan (and Ryan) more deeply than I ever could have, but if given the chance, I would want my girl healthy...whole. I hate that she has to suffer. Other kids her age are running and playing and laughing and she's sitting in a chair, having to be restrained so she doesn't hurt herself because the pain is so bad! Don't get me wrong...I know we are blessed to still have her here. I know far too many that have lost their little ones much younger...I know more that are fighting for their lives in the hospital right now. But there are days (like today), where I just long to be that "normal" Facebook family...going on wonderful vacations, having mother's day tea at school, going on dates with my husband. It's tough. It's isolating. And days like today, I'm sad and wish for more for my girl. As for now...she's calm and she's sleepy. And for that, I am thankful. 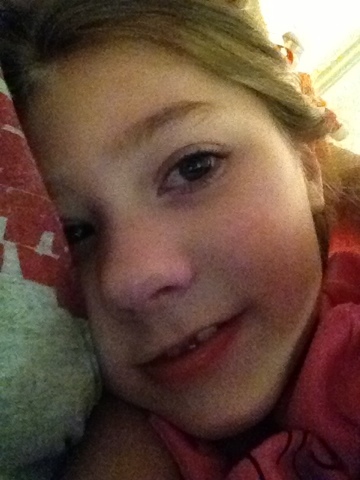 Praying she gets a good night's sleep tonight and wakes feeling much better tomorrow. Reagan slept like a log last night. She woke up this morning right at 8am, but she did NOT have a smile on her face. Her eye brows were all knitted and she did not look happy in the least! She stayed calm though and made it through OT without any incidences. She dozed off at the end and then proceeded to sleep the entire day! PT came anyway and stretched her (and applied some kinesio tape to my back...thank you) and she kept sleeping. She finally woke up about 5min before the nurse left. Again, no smiles, very serious, very tense. The way she was today reminded me of a bad day only without the crying (it's hard to tell if this is a slightly better bad day or God forbid the prelude to something worse). I gave her some Lortab, but it didn't seem to do anything. She dozed off 3hrs later at 9pm and she's still asleep now. Hopefully she sleeps off this bad attitude and wakes feeling much better tomorrow! Prayers for my girl are appreciated! Sleep was about the same last night for Reagan. She was hesitant to go down and then woke back up around 3am. Her nurse picked her up and held her, and she'd doze here and there, but she never made the transition back to laying down (she had to hold her the whole time). Ryan woke around 6:45am, so I got up with him, and Reagan was awake. She looked tired, but she never fell back to sleep. 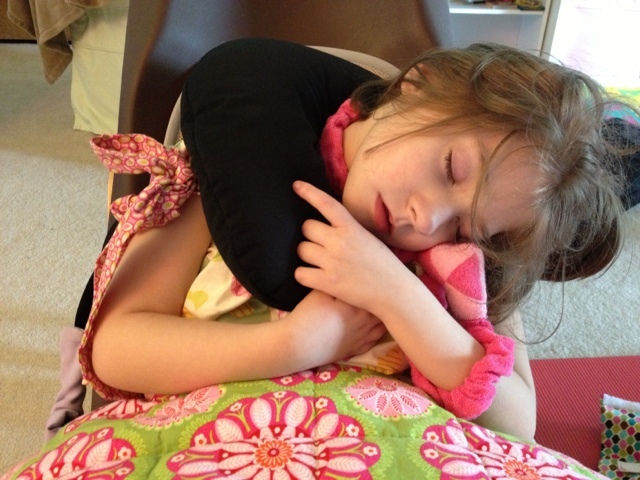 She dozed off once today, right before speech, but her brother quickly woke her back up. She's been super spitty all day...dripping like a faucet spitty! She used to do this a lot (we would go through many shirts, bibs, and blankets a day), but she hasn't been like this in a while. She didn't really seem nauseous though, so that's good. She also had FOUR dirty diapers today! Craziness! She had two yesterday (which is a lot for her), and then four today! Not really sure what that's about, but at least she's getting it out! She's been very sweet today...lots of laughs...but she's still very tense in her body. I tried to hold her today and it was almost impossible (because she's so stiff and squirmy). Hands in her mouth and hair nonstop. I've made an appt to get her hair cut on Friday. We're going to go back to the short bob for the summer. It gets it out of her face and keeps her from getting her fingers tangled up in it (who knows how much hair she's ripped out and eaten)! Please keep her in your prayers that she continues with the good days, tolerates the increase in calories of her formula, and doesn't lose any more weight!! I'm beginning to sound like a broken record, but I'm really not sure how much Reagan slept last night! The video monitor that I have sitting by my bedside, died last night because the charger wasn't plugged in! I do know that when Ryan woke us up this morning at 6am talking, Reagan was wide awake and kicking around in her bed! I don't know what's going on with these two and waking up so early, but I'm going to have to start getting to bed earlier if this continues. Reagan has been a good girl today. 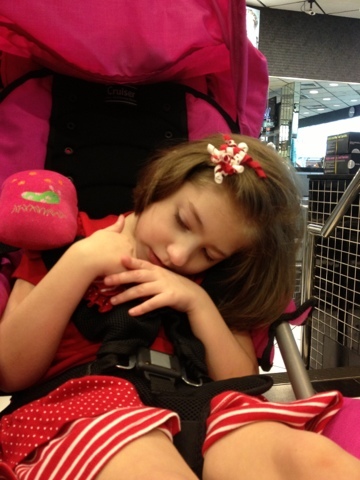 She had OT (with the vision therapist assisting) this morning and then speech and then it was off to the GI doctor. Reagan was a trouper and was so great with all of the chaos.They weighed her and she's down to 37.4lbs (from 35.4 in January). This is a pretty significant weight loss, but somehow she's still right at 50% for her age group (and her BMI is good). The doctor agreed, we don't want her losing another pound, but he was hesitant to admit fault. We were kind of going round and round with our conversation and not really getting anywhere. We've agreed to increase the ratio of the formula slowly (2.5kcal/oz per week) until we get to 30kcal/oz and if we see signs of her not tolerating it (nausea, diarrhea, more bad days, or her labs are off), we'll have to possibly consider giving her more volume at a lower calorie ratio or supplementing calories with something like benecal, or switching formulas altogether. We're obviously seeing marked improvement in her since switching her formula. Less bad days/more good days & no nausea, it's been wonderful. My question is...is this change for the better because of the switch in formula itself, or is it more because of the decrease in caloric intake? I don't know, but I would guess, that it takes less energy to digest a lower calorie formula than one that is higher calorie. I mean, when her tummy is having problems, we switch her over to pedialyte to give it a rest. Have we been inadvertently "resting" her tummy this entire time?? I don't know. Anyone have any thoughts on this? Please keep it in your prayers that she tolerates this increase and that we can get her back on track again and keep her from losing any more weight! I want my girl healthy AND happy! Is that too much to ask?!?! Again, not really sure how much Reagan slept last night. She woke several times crying out (usually because she had rolled over onto her face). Mike got up with her each time and was able to get her back to sleep (the Lortab helped a little). Both Reagan and Ryan were wide awake and ready to get up at 6am today (ugh)! Reagan has been tense all day, but OK. During OT she let out a couple fusses to let her therapist know she was not happy, but she held it together. She had school this afternoon and her teacher kept it low key and she did OK with that as well. She's just very tense, lots of movement, hands constantly in her mouth, not a fan of talking or loud noises (like her crying brother)! Speaking of, Ryan was SUCH a handful today. Crying, hitting, biting, and throwing himself on the floor...I'm not sure what to do with this kid! 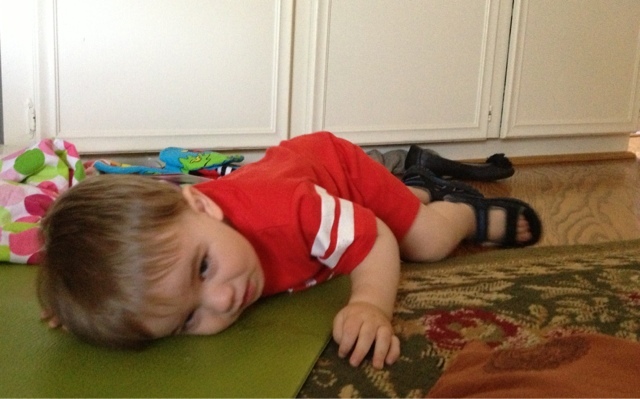 I reinjured my back today, trying to catch him (before he hit the tile) as he threw himself back in a temper tantrum! It was a trying day to say the least (leaving me in tears)...and I even had help today! My mom had to go back home tonight so I have no clue how I'm going to manage mentally or physically tomorrow. 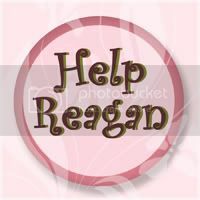 I just have to pray that Ryan will behave himself and that Reagan will as well! We're taking Reagan in to the GI doc tomorrow to discuss this whole formula fiasco (them putting her on a 20kcal/oz formula from a 30kcal/oz and her losing 6lbs)! I've already started slowly increasing the concentration...I started at about 22.5 and now we're at 25. Hopefully she tolerates it well and can put that weight back on (or stop losing at the very least)! Tonight she's been making these little burpy noises over and over again. Not really sure what that's about (reflux maybe?). I fed her some bananas and mixed berries around 6pm and she really seemed to enjoy it...I sure hope that's not what is bothering her! Thank you for your continued prayers! Sleepy (with an attitude) today! We're not sure how much Reagan slept last night. Her brother woke up around 12:30am screaming and we had decided to let him cry (my back was too bad to pick him up and he freaks out when anyone other than me tries to pick him up at night)! So I turned down the monitor and that was it. Once he finally stopped, I never heard another peep. When we woke up at 7am this morning, Reagan was wide awake and had kicked herself sideways in her bed and Ryan was standing up jib jabbering. My back was so sore, I could barely roll out of bed. It's gotten better the more I have moved around today, but the pain is constantly there and when I move just wrong it really really hurts! Ryan has been quite a stinker today. I'm not sure what his deal is lately. Maybe he's getting some molars in (he's biting a lot), or maybe he's just going through a phase and throwing some serious temper tantrums?? Reagan has been good today but definitely a little on edge (of course who can blame her with all the crying). Still having tummy troubles. She had a make up session of speech today and after a quick pit stop, she did ate half a thing of pear cinnamon oatmeal. Later on, I fed her another half a container of banana, apple, pear. She really seemed to enjoy it...opening her mouth and taking very good bites...she's an eater now! Tonight right before bed she started getting a little more vocal (sounding slightly agitated), but she fell asleep with the help of clonidine and hopefully she'll get a good night's sleep and wake up in a good mood tomorrow. Reagan slept well last night, while her brother kept waking up crying. It may be time to let him cry it out...especially considering I pulled something in my back this afternoon and I can barely walk, much less pick him up! I woke up this morning to Ryan jib jabbering in bed and Reagan wide awake and turned completely sideways in her bed! She's been a good girl again today, but maybe a little more tense. There have been a few times where she's made whining noises that sound like she might be getting upset. I think her tummy is giving her problems. 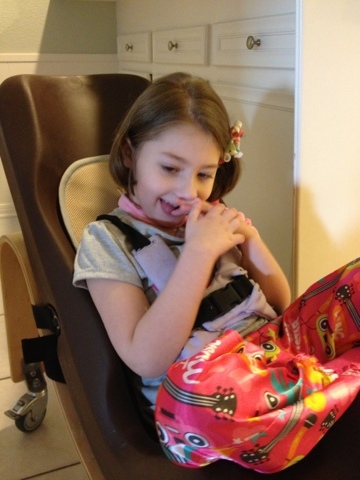 The thing is, most kids with mito/seizures etc... have issues going to the bathroom. Many of the medications they are on have constipation as a side effect, but mito itself causes slowing of GI motility leading to even more issues going to the bathroom! Reagan has been on laxatives since she was a baby. Doses that would send adults to the toilet nonstop! We've tried just about everything...Miralax, lactulose, senna, glycerin suppositories, Pedialax liquid suppositories, milk of magnesia...but nothing gets her going on a regular basis! We're lucky to get her to go every 4-5 days and sometimes she goes a week or longer. But what I've found lately is that even when she needs to go, she can't. She's clenched down so hard, she refuses to let it out! That's where I come in. I have to help her go...otherwise there's no telling how long she would hold it in! I had to help her twice today and both times she fell asleep afterward. This is obviously something neurological...her body just won't relax and let it out...but I wonder if there's anything they can do to help with that? I don't know if "clenching" is a common problem or something unique to her. I definitely need to discuss this with her GI doc. Poor girl...can't even poop on her own! She's a sweetie though and she sure is going to be happy to see that Grandma is coming tonight! Hopefully she hangs on and continues to have good days...for everyone's sake! Reagan fell asleep on her own last night but then woke back up only 30min later. Clonidine helped her to fall back asleep and she slept til 4am. The night nurse picked her up and she slept off and on in her arms the rest of the morning. On a side note...we're losing our new night nurse (she's been working Mon/Thurs nights). She just found out she's pregnant and she needs to find something closer to home (she lives 45min away from here)! We're going to miss her! We're thinking we're just going to keep our Tues/Wed nurse (who has been with us over a year now) and leave those nights open. It's nice having someone here to help out (especially when Reagan is up or having a bad day)...but she's been sleeping better lately and I just don't think it's worth it to train someone new when we're probably going to be moving in the next couple months! How was that for a side note?!?! Reagan has been a super sweet, snuggly girl again today. She had PT this morning and her therapist was amazed at how calm and still she was!! 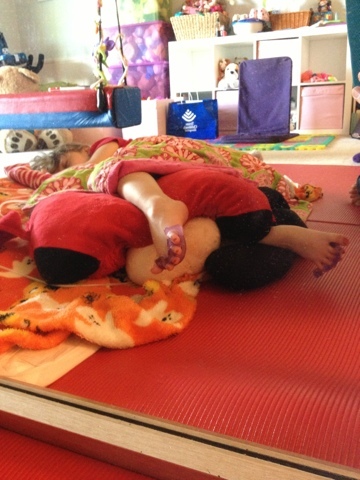 Well, within an hour after therapy she was OUT and slept most of the day!!! She woke right around 4pm and stayed awake til 10pm. Her temperature regulation is a bit off (cold hands/feet and sweaty back)...but other than that, she's been perfect. Such a sweet girl!! Sure wish I could say the same for her brother!! (Awake again last night and already up once tonight! Ugh!) One more side note...today when I was giving Reagan her bath I noticed how skinny she was looking so I decided to weigh her! She's lost another 3lbs! She's gone from 45lbs to 39lbs in just a few months (since switching to the new formula)! So I went back and looked at the can of the Nutramigen PurAmino she's on. The way I've been making it (the way the can says and the doctor said to make it), it's 20kcal/oz. The Neocate Reagan was on before was at 30kcal/oz!!! That's a HUGE difference! Ugh. I can't believe her doctor's office didn't figure that out! At our last appt they saw she had gone from 45lbs to 42, but they weren't concerned about it! Too bad no one bothered to think "now why is she losing 3lbs?? "...maybe someone would have caught this sooner?!?! So my concern...is the recent improvement we've seen in her due to the new formula or the fact that we've been unintentionally "resting" her tummy by giving her watered down formula??? I don't know. I'm going to slowly increase the ratio over the next week or so and get her where she's supposed to be, please keep it in your prayers that she handles it well and we continue to see our sweet happy girl! Reagan slept well last night, she started moving around at 5am so her night nurse picked her up and she fell back asleep in her arms. She woke up sweet and smiley again today. Still very calm and oh so cuddly! Her brother was up crying a lot last night. Not sure what's going on with him. Several nights ago he had two consecutive nights that he slept the whole night through, then he had a night where he woke up three times, and then another night where he slept the whole night through (I was hoping we were finally making some progress)! Then last night he woke up a few times super upset and was very difficult to get back down and then tonight he's already woken up crying once. Ugh. We take one step forward and two steps back! Anywho, I was so tired this morning, I didn't hear my phone ring at 5am! Let me just tell you, it's never a good thing when the nursing agency is calling you at the crack of dawn! Our nurse called in sick (for the second Thursday in a row). They didn't have anyone to fill in, but they would call around. At first I was very worried, because Ryan threw a fit and was screaming (right before the night nurse left) and Reagan started fussing and getting agitated! 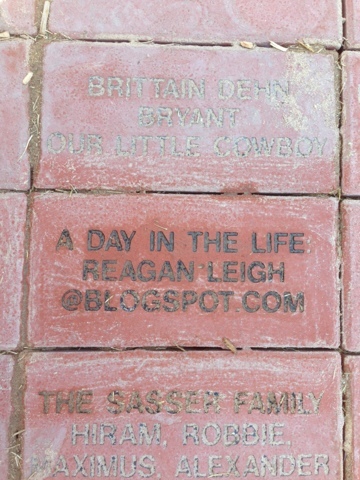 I took Ryan away and brought him back calm a couple minutes later, and thankfully Reagan was good the rest of the day! This morning was busy with therapy...she had OT at 9am and Speech at 10am. She did really well for both. OT had another great session with her and she's just loving her being so relaxed! We have been putting her dynamic AFOs on her each morning for an hour (today we did 2) and she's not fighting them at all and they are really helping to settle her leg movements down and keep her still and relaxed. During Speech she ate a half a container of oatmeal with mixed fruit...again, she's impressed with how well Reagan is doing. Then she had some time to relax and the nursing agency sent out a nurse to fill the second half of the day. 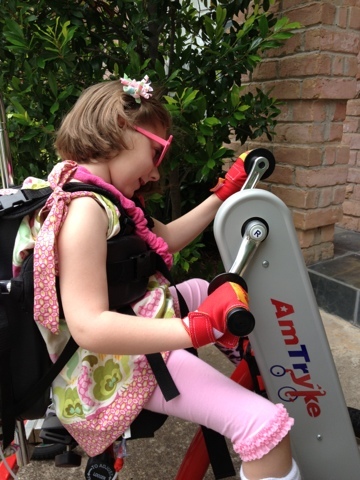 Reagan had PT at 2 and her therapist kept saying how this is the best she's ever seen her! Afterward she put on her AFOs and Reagan stood in her stander for an hour. She really has been such a good girl. She's still putting her hands in her mouth a lot...that poor left pointer finger is really red from getting gnawed on nonstop! Her hands and feet have been cold and clammy and tonight she sweat through the back of her top! Other than that, she's great! Brother has been a handful, but what's new. I ran to the pharmacy today and while sitting in the drive thru Ryan coughed once and then proceeded to throw up all over himself and his carseat! I don't know if it's just because he's got some sinus drainage (he's been sneezing here and there) or if it's something else. Hopefully nothing. He's also really picked back with the biting lately. 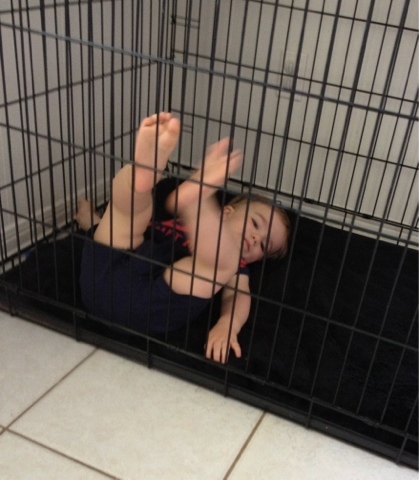 What can I say...he's trouble. Reagan slept all night and woke up around 6am (thank goodness for the night nurse)! She was a little groggy this morning (probably from waking up so early, but she never dozed off. She had speech, speech from the school system, and "school" today and she did well for them all. She was very mellow again today. When being held she was completely still and calm, in her chair she was still a little kicky and playing with her hair. Tonight I held her and she was such a snuggly princess. Right before the night nurse got here I thought I noticed her doing something weird with her eyes. Then about 45min later, when the nurse was holding her, I think she was doing it again. It's something I've seen on occasion. Where she's looking down and kind of fixes her eyes in one direction and when/if you can get her open her eyes, she opens them in this wide crazy bulging way. It's hard to explain. It looks seizure-ish to me (then again, other things have looked seizure-ish to me but were disproven via EEG, so who knows). Hopefully it's nothing. Just some weird neurologic/opthalmologic quirk. Hopefully. That reminds me...we never got her lab results back on her Banzel levels. She has grown over the years and we still have never increased her dose. 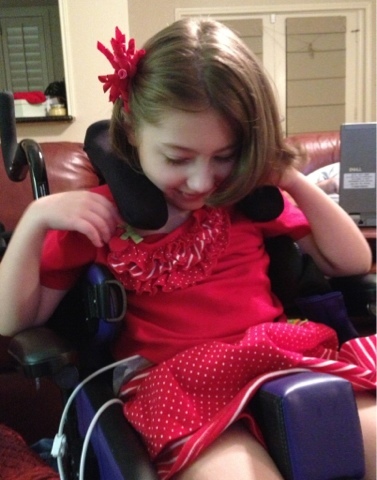 It's something we don't want to increase if we don't have to (obviously), but if she's starting to have breakthrough seizures, then we definitely need to increase it. But again, hopefully it's nothing. Speaking of seizures...please pray for Grayson tonight. He was taken to the ER last night with high fevers and a bad seizure. They still can't get his fevers down and tonight he's been moved to the ICU. Lots of prayers needed for him and his family!